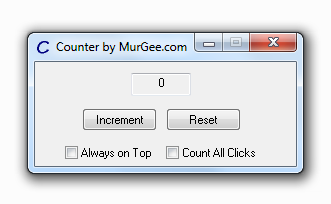 Presented here is a Counter utility which can be used to count manually or can be used to count all the click performed on your windows computer while the Counter utility is running. In order to count manually, you would need to press the Increment button as displayed in the screenshot below. On the other hand side, if you just want to keep track / count of all the clicks made, you would need to check the checkbox labelled Count All Clicks and the software will automatically detect any clicks performed on your computer. In order to reset the count, just press the Reset button and this will make the counter start from 0. You can easily close the Counter using Alt+F4 or by pressing the top right close button. The Next time Counter utility is started, it will start counting from 0 and will forget the last counted value. There are other features in this Counter utility which makes it really easy and helpful to do the counting. The Counter Utility is totally free to download and try and does not requires any sort of registration and does not displays popup reminders. The Counter remembers it’s last location and hence in case you do move the utility around on your Windows computer screen, next time the Counter will reposition itself automatically to the last location on Windows Screen. You can drag and move the Counter using title bar or any location of the Counter’s main screen. The Always on Top Checkbox when checked repositions the Counter to the top of all other visible windows or at the top of Z order. The CheckBox Count All Clicks when checked enables the functionality to automatically increment the counter value whenever Left, Right or Middle Mouse button is pressed on the Screen. Download and try out this Counter Utility for free on your Windows 8, Windows 7, Windows Vista or even on Windows XP computer. In case you would like to suggest any new features in the software, you can drop an email to the support team and they will try their best to get the related feature implemented in the utility. MurGee.com has various other Mouse Automation Software Utilities which allow much more sophisticated control of mouse clicks.